[PDF] Sociology: A Brief Introduction (10th edition) | Free eBooks Download - EBOOKEE! Description: Make Sociology new with McGraw-Hillâ€™s Connect Sociology and the 10th edition of Sociology: A Brief Introduction. New to Connect is Investigate Sociology, a brand-new tool that develops studentsâ€™ sociological imaginations by placing them in provocative scenarios where they must analyze various sources and determine a solution. Connect also comes with LearnSmart, an adaptive questioning tool proven to increase content comprehension and student results, as well as fun interactivities like In their Shoes and Applying the Perspectives that teach sociologyâ€™s three theoretical frameworks. Finally, make sure students come prepared to class by assigning our many e-book activities. With McGraw-Hillâ€™s digital tools, focus on what you do bestâ€”teaching. Unique to this program, Sociology: A Brief Introduction encourages students to take sociology with them in their everyday lives, just as Rick keeps a small notebook of daily sociological events. In Sociology brief, instructors get the most trusted content in manageable form. 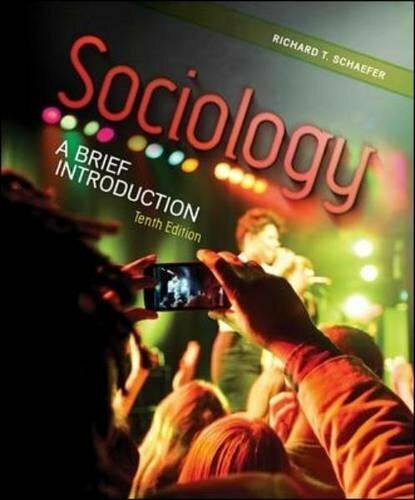 This, coupled with powerful digital learning tools, makes Sociology brief an ideal choice for your introductory course. No comments for "[PDF] Sociology: A Brief Introduction (10th edition)".